> WHAT SIZE ARE THE PLANTS? 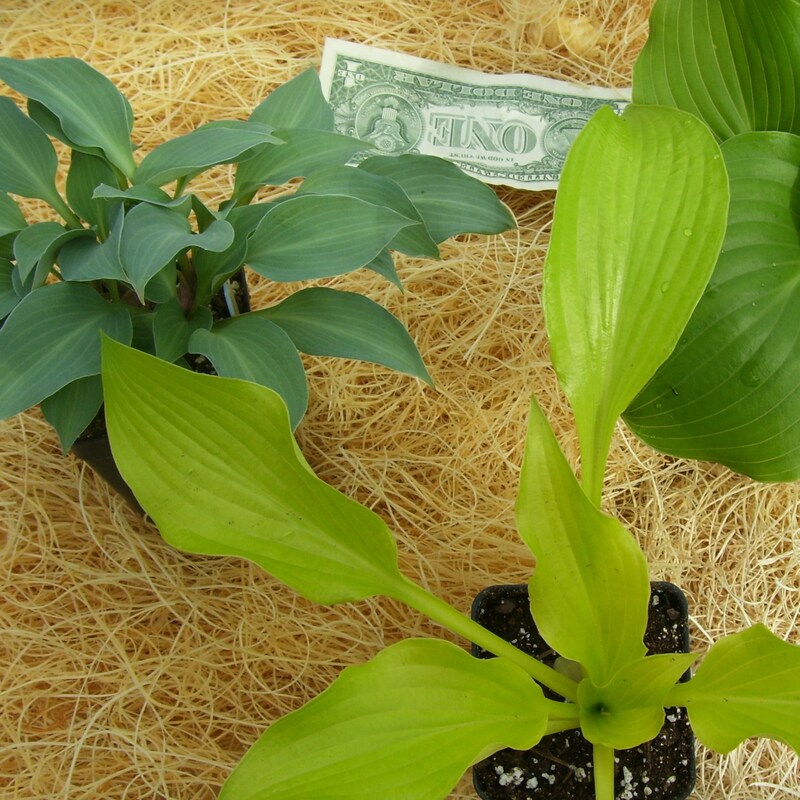 ← Pictured here are some hostas in our Classic 3" Pot. Below is a description of each plant size so that you know what to expect. Growing instructions are included with every plant order. ~ Liner = This is a very small starter plant, the size most often used by professionals. Most plants are Stage-4 Tissue Cultures. Plants will have 1-3 leaves and a small tender set of starter roots with the growing medium still in tact. The total length of these plants are usually 3-5", including the roots and the foliage. Plants need constant nurturing. Liners should only be started early in the season so that they have time to establish a good root system before winter. Plants need to be started outside in pots and later transplanted into the garden. We offer a nice selection of hosta & heuchera liners. THIS SIZE IS NOT RECOMMENDED FOR BEGINNERS! ~ 3-Pack Starter Liners = Plants in this small 3 pack are well rooted and ready for your garden. Size is similar to a 3-pack of annual flowers. 18 of these 3-packs fit into a 10" x 20" plant tray. We use this size most often for ground-covering plants. ~ 2" Pot = We use this pot to grow our smaller sized hostas, those that might other wise get "lost" in a bigger pot. Hostas in 2" Pots have been over-wintered at least once. Plants have 1-2 eyes & are of blooming age. Other perennials grown in this pot are well rooted and of blooming age/size. ~ Classic 3" Pot = This is our original pot and the size we continue to use for most of our hostas. Plants in this deep 3" pot are shipped well rooted and growing (13.3 fl oz.). Plants are of blooming age. Hostas have been over-wintered at least once, most twice. Plants have 1-2 eyes. All other perennials in our Classic 3" Pot are well established plants, many in their second year and all are of blooming age/size. ~ 1 Quart Pot = These plants are very well established and shipped growing in a deep 1 quart pot (36.2 fl oz.). Hostas in this pot have been over-wintered at least 2 times and plants have multiple eyes. All other perennials in our 1 Quart Pots are very well established and have overwintered at least once. Plants of this size are exhibiting mature characteristics in leave size and foliage texture & color. We offer a very limited number of 1 quart hostas. Other plant varieties are occasionally offered in this size. ALL PLANTS ARE FREE FROM DISEASE, INCLUDING "HOSTA VIRUS X"